Forward Turn is youth-led charitable grantmaking program that takes a “forward turn” to benefit communities in Fauquier and Loudoun Counties. Learn more about this year’s guidelines and deadlines here. Forward Turn is a partner with Youth Advisory Council in Loudoun County and funded by the S. Murray and Mary H.C. Rust Student Philanthropy Project endowment of the Community Foundation for Loudoun and Northern Fauquier Counties. Who is Eligible to Apply . . . and, Who receives the grant? Forward Turn grant appli cants may be faith-based programs, government programs, area charities, and schools. While the grant application might be written and prepared by an adult project leader, we do require that a youth volunteer and program participant write a Letter of Endorsement that should be submitted with the grant application. We have a high priority for proposals written by youth. Check out our past grants for ideas. 2014 – 2015 Grants $4,000 given in grants for youth driven projects. $500 for Loudoun Habitat for Humanity to help start a “United Youth” program linking Key Club students as Tuscarora High with volunteers of Habitat to serve lunches to volunteers, raise funds and more for the organization. $1,000 to Highland School to support a “teens opposing poverty” project, recruiting students to help provide food and personal products to homeless families in Fauquier County. $1,500 to Loudoun Volunteer Caregivers to help expand the organization’s “youth caregivers” program partnering adult volunteers with youth volunteers helping home and services to housebound Loudoun citizens. $1,000 to McLean Bible Church to join in a community wide effort with area schools to donate gently used (and with our funds buy) shoes for kids in the Dominion Republic. $500 To Foxcroft School’s engineering team, to offset costs for materials to build waiting room benches at Middleburg’s Seven Loaves food pantry. 2012 – 2013 Grants $5,000 given in grants for youth driven projects. $1,400 “Bedtime Stories” by a Heritage High School student to create a DVD project of local elderly reading a child’s book to send to family across the miles. 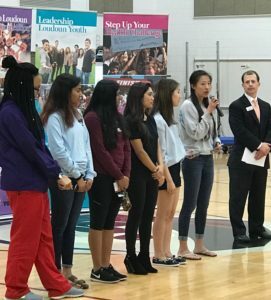 $500 each to support Loudoun Youth Advisory Council’s Annual Step-Up service projects competition within Loudoun County Public Schools. $500 J. Michael Lunsford Middle School “Mission Green Team” to build a box garden and encourage a clean environment! Four young middle school boys are on a mission to educate others about how to keep our environment clean. $500 Freedom High School “BEAST” program to support a before and after school tutoring created and implemented by honor students who set up tutoring for other students in an informal setting at school. The grant helped expand capacity to add sessions with support for workbooks and other supplies. $2,500 The Loudoun Symphony for the Loudoun Youth Symphony Orchestra (LYSO): Ensembles For Everyone to help develop a pilot program for students with special needs to experience and participate in a musical performance with the LYSO. $2,500 Woodgrove High School Nature Trail and Outdoor Classrooms to create a nature trail and outdoor classrooms that allow students, both at Woodgrove High School and Mountain View Elementary School, to observe, experience, appreciate, and learn about the environment and it’s natural beauty. The Student Philanthropy Project funded the first of three phases which includes the installment of one outdoor classroom, two bridges, and half of the trail connecting Mountain View Elementary School with the western perimeter of Woodgrove High School. The trail will also be available for cross country training.